As a data analyst, you provide insights to decision-makers throughout your organization. But, you need an end-to-end analytics platform that lets you perform. Unleash your inner BI hero with Yellowfin. Effortlessly connect to all your data sources and quickly prepare data for analysis and reporting in a single virtualized environment that eliminates the pain of data migration. 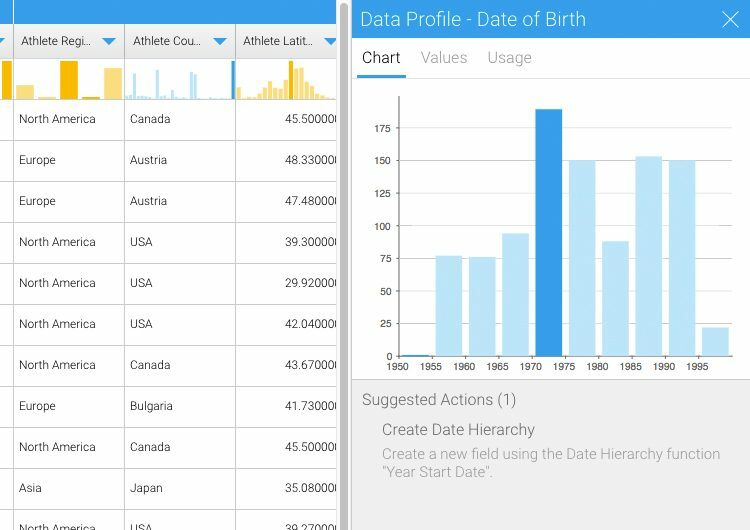 Use sophisticated data discovery features to mash-up and explore data. Turn data into knowledge by creating stunning visualizations, dashboards and Storyboards your users will love. Seamlessly collaborate with all your stakeholders to deliver the best insights at the right time. Then, securely publish trustworthy content to any platform or device – whenever and wherever it’s needed for decision-making. Put an end to limited, lifeless business reporting. Go from data source to dashboard in one place, and transform your organization’s data into an engaging analytical experience on which you can act. Yellowfin has its own data preparation module that is part of the Yellowfin platform. Model, profile, cleanse, shape, enrich and publish with Yellowfin’s virtualized data prep module. Get a complete view of data lineage from source to dashboard and save time doing what’s most important - data analysis. Yellowfin gives you the power to find answers with its intuitive and interactive platform. Create stunning visualizations, spot trends and add context to your data. Go beyond standard data discovery and create rapid comparative analysis with Yellowfin’s ‘Set Analysis’ to easily define and compare a subset of data values within a selected data set using simple point-and-click navigation. Whether it's big data sources, Web APIs or relational databases, we do not get in the way of you and your data. Delivering content to your stakeholders is easy within Yellowfin's single, integrated platform. With a workflow for approval of content and security baked in, deploy your content knowing it will be in the right hands at the right time. 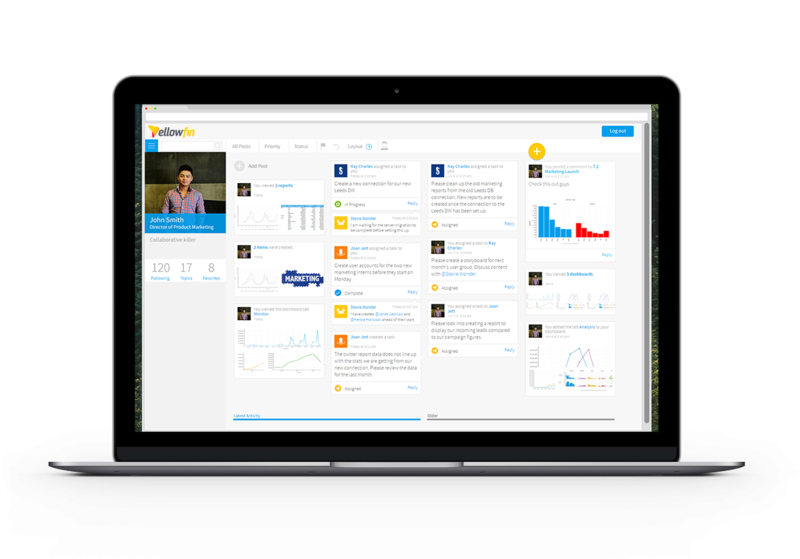 Yellowfin's awards winning collaboration gives you the ability to collaborate with all your key stakeholders in real time. Have the conversation where your data lives. 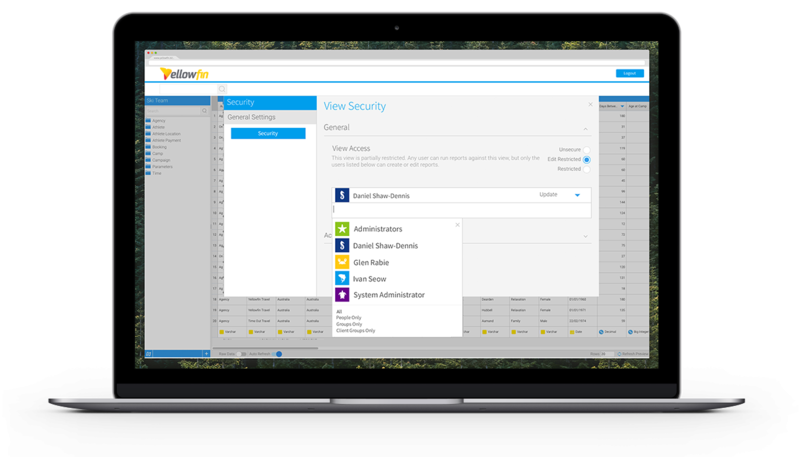 With Yellowfin’s task management, common BI tasks are controlled within your BI platform. Never wait for unproductive emails to get report requests fulfilled and be alerted whenever a data quality issues arises. 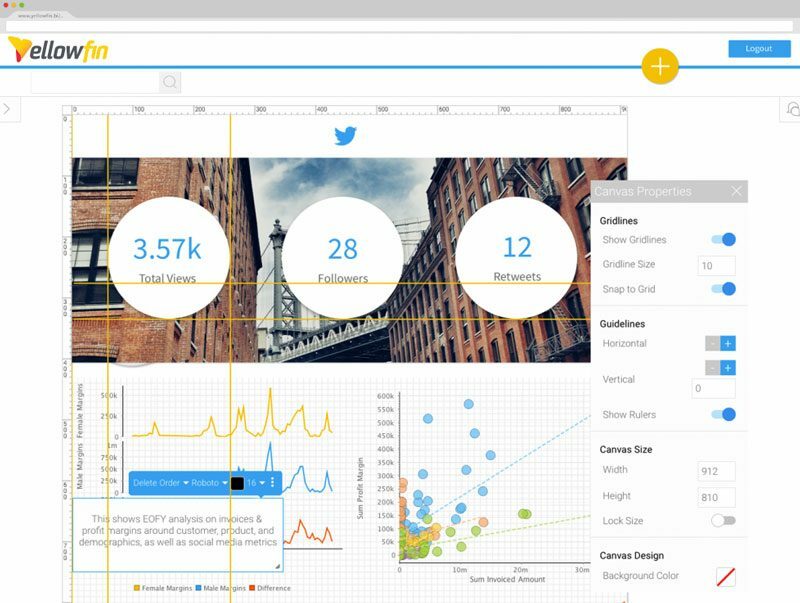 Yellowfin’s content design canvas provides the power and freedom to quickly create beautiful, purpose-built analytical content. Meet your organization’s customized content needs, exceed expectations and drive user adoption – all without writing one line of code. Be empowered to modify and position every element and aspect of the canvas perfectly, down to the individual pixel. Stunning infographic reporting is now just a few clicks away.